Design-wise, the LG Spectrum is nearly identical to Optimus LTE LU6200, whereas AT&T’s version takes after Optimus LTE SU640. We noticed that the back has changed though – it’s now glossy and gets smudged all over with fingerprints very quickly. Still, the important bits are all unchanged – the high-quality, high-resolution display is one of the best on the market (or soon to be on the market), the Qualcomm MSM8660 Snapdragon chipset (1.5GHz dual-core Scorpion processor, Adreno 220 GPU and 1GB of RAM), 8MP camera with 1080p video and, of course, the LTE connectivity. 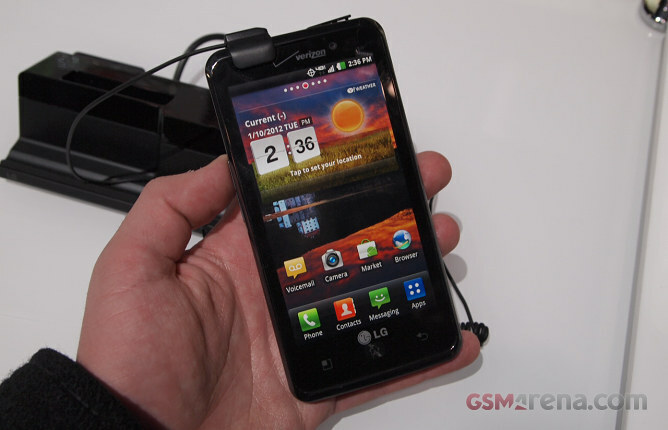 The microUSB port on top of the LG Spectrum is an MHL-enabled port, so you can hook up the phone to an HDTV. There’s 4GB of built-in storage and a preinstalled 16GB microSD card, so there’s plenty of room for videos. We tried out the LTE connectivity very quickly and our site loaded very fast. Unfortunately, we didn’t have enough time with the LG Spectrum to run a proper speed test and see how it handles on Verizon’s 4G network. The fast LTE connection enables painless video streaming. The Spectrum comes preloaded with Netflix HD and ESPN apps that give you access to movies and sports on the go. By the way, the LG Spectrum is up on Verizon’s site if you’re thinking about buying it. It’s $199 with a 2-year contract or $589 if you want it off contract. Make sure to check their 4G LTE pricing too as you’ll need one.